England and India will meet for a place in the tri-series final after India's game against Australia was washed out by rain. Only 16 overs were possible at the Sydney Cricket Ground as India avoided the defeat that would have all but secured England's qualification. India had reached 69-2 when a third rain delay forced play to be abandoned. England are three points ahead of India in the table, with four on offer for the winner of Friday's game in Perth. The final, against Australia, will be played at the Waca in Perth on 1 February and represents both teams' last one-day international before the World Cup starts on 14 February. Australia qualified for the final with a game to spare after winning their opening three matches. 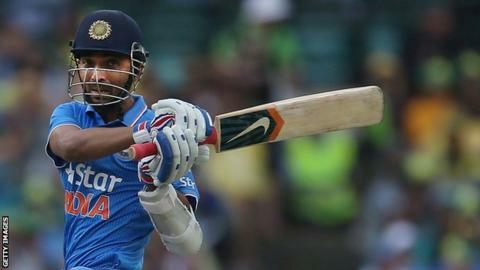 England beat India by nine wickets to claim a bonus-point win in their previous group encounter. Rain delayed the start in Sydney by 40 minutes after India lost the toss, interrupted play after 16 balls and returned to force play to be abandoned at 20:05 local time (09:05 GMT). Ajinkya Rahane was unbeaten on 28, having seen Shikhar Dhawan (8) edge to slip and Ambati Rayudu (23) fall to a splendid David Warner catch over his shoulder running towards to the boundary. India remain without a win in nine games on their tour of Australia. Who's still standing after weekend of FA Cup shocks? Read more on Who's still standing after weekend of FA Cup shocks?